Quick Cure 5-Minute Epoxy Adhesive Kit, 8 oz. System Three 1000K10 - Quick Cure 5-Minute Epoxy Adhesive Kit, 8 oz. Quick Cure-5 is the standard quick setting "five minute epoxy" system. Mix at a 1:1 by volume ratio. 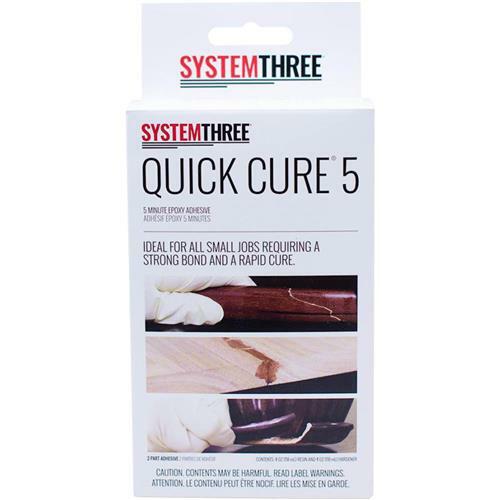 Quick Cure's ideal for all small jobs requiring a strong bond and rapid cure. Quick Cure is highly water resistant but not waterproof. Quick Cure is quite thick, but is easily measured by squeezing equal sized lumps from the convenient application bottle.